Two specters from the early 1990s haunt today’s conservatives when it comes to their efforts to reshape a closely divided Supreme Court. The first is David Souter, the “stealth justice” George H.W. Bush appointed in 1990 who eventually turned out to be a reliable member of the Court’s liberal bloc. The other is Clarence Thomas, whose relatively easy confirmation in 1991 was very nearly overturned by late-breaking revelations concerning his behavior towards women. These two cautionary tales explain the exceptional emphasis placed by conservatives in the ideological and personal vetting of SCOTUS nominees. And vetting became even more urgent early in 2016, when a presidential candidate with no clear association with the conservative movement, and a history of being “wrong” on the crucial issue of legal abortion, started nailing down the GOP nomination. That’s when Donald Trump took the unprecedented step of publicly releasing a list of candidates he would consider for the existing vacancy on the Supreme Court, prepared under the supervision of the hyperorthodox Federalist Society and Heritage Foundation. This list had a lot to do with the gradual and grudging acceptance of Trump by serious ideological conservatives who (rightly) viewed lifetime judicial appointments as more important than day-to-day legislation, and who (again rightly) thought of the future direction of constitutional law as being on a knife’s edge in a closely divided Supreme Court with many aging justices. Perhaps even more importantly, the SCOTUS list was enormously reassuring to conservative evangelical leaders, who embraced the heathenish Trump with genuine enthusiasm after he in turn embraced their constitutional agenda focused on eroding or reversing the right to an abortion and sanctioning discrimination based on “religious liberty.” Trump’s vetters continued expanding and refining his list after the election; a second revision netted Brett Kavanaugh, a favorite in conservative legal circles who was probably passed over initially because of his friendship with the Bush family. Confidence in the SCOTUS vetting process has been obvious throughout the Kavanaugh saga. 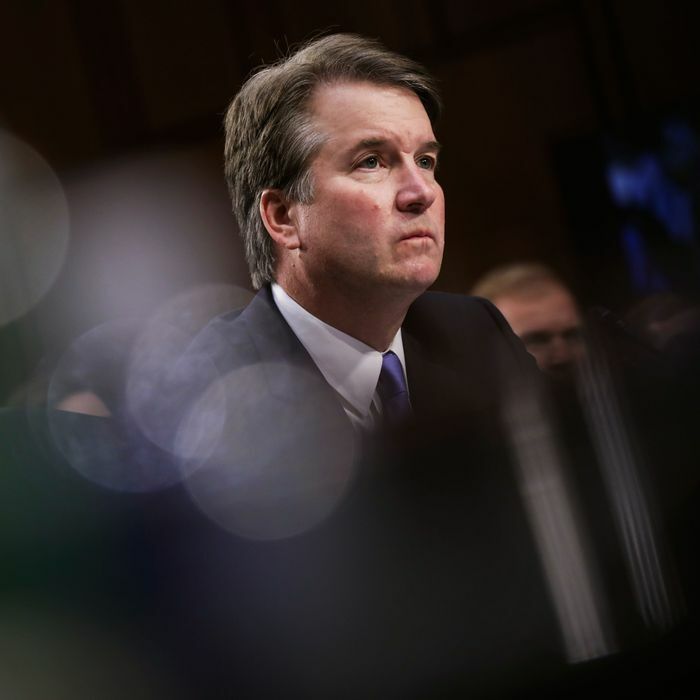 With virtually every imaginable validator of a jurist’s hostility to reproductive rights backing him unconditionally, Kavanaugh was able to play rope-a-dope during his Judiciary Committee testimony, repeatedly stressing his respect for Roe v. Wade as a constitutional precedent while refusing to comment on what he might do when a challenge to the right to an abortion arrives at the Court, which it will in a matter of months. And everything about Kavanaugh suggested a man who had prepared for this moment his entire life — not someone likely to have moral or psychosexual skeletons in his closet. Two of the three people chosen to introduce the SCOTUS prospect were women, one of them a celebrity with a reputation as a pro-choice centrist (Condoleezza Rice) and the other a progressive practicing lawyer (Lisa Blatt) who said Kavanaugh had counseled her about “work-family balance” issues. He touted his mother, a prosecutor and trial judge, as the person to whom the title “Judge Kavanaugh … will always belong.” He made sure to mention that a majority of the law clerks he hired as a circuit court judge were women. And he devoted a long paragraph to his experience in coaching girls’ sports teams, while working in a reference to his own daughters. Now all this preparation could prove to be an ironic waste of time if Kavanaugh is felled by a credible accusation of sexual assault such as the one now being publicly articulated by Christine Blasey Ford. And all of Trump’s efforts to reassure conservatives appalled by his own predatory attitude towards women over the years could go out the window as well if his and his team’s defense of Kavanaugh begins to sound like it represents the solidarity of the men’s locker room. The fraught timing of Kavanaugh’s potentially calamitous problem is obvious enough: If the Senate vote on his confirmation slips much at all, SCOTUS could begin its next term on October 1 lacking the reinforced conservative majority he was supposed to supply. If its slips past the midterms, then Republicans must decide if they really want to pursue a controversial confirmation during a lame-duck session. And should Democrats actually win control of the Senate, the stakes would skyrocket as conservatives begin to realize this could be their last unencumbered shot at a SCOTUS nomination for an unforeseeable stretch of time. Turns out there was another good reason for going with a woman as well: Few men of Kavanaugh’s generation and privileged status can be presumed to be entirely safe from the possibility of an incident of sexual misconduct. An administration led by a frequently accused sexual predator and determined to make an assault on women’s reproductive rights really could not afford the kind of supreme mistake it may have made with Brett Kavanaugh. But all the vetting in the world did not protect them from disaster.